PLACE Blog: "What's wrong with this place?" Image (c) 2010 - S.Golden, L.McComish. Urban Research Belfast. 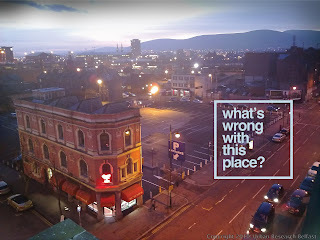 “What’s Wrong with This Place?” aims to challenge preconceptions about Belfast’s neglected urban centre through visual and physical explorations by students in architecture and visual communication at the University of Ulster, Belfast. Since September 2009, students from both disciplines have used a variety of tools inside and outside of their classroom environment (films, photographs, map studies, models and field experiments) to study the area between Smithfield Market, Donegall Street, Royal Avenue, Millfield and Carrick Hill. This district has existed within the cultural shadow of city centre life for over 30 years, experiencing ongoing economic and physical loss. The students have been asked to explore without prejudice, to ask questions, measure and observe in addition to undertaking small-scale experiments. The results are often surprisingly poignant and beautiful observations about the notion of place that move beyond the immediate surface to explore the people, spaces, history and culture of an area that once formed the heart of Belfast. In this way the collaborative teaching and learning project, in association with PLACE, seeks ways to better engage students to participate with their wider community and the built environment; to test out the skills and tools used to educate architects and designers on understanding urban issues beyond the classroom. Students will display an interpretive documentary film and photographs at Adhoc Galleries (off Kent Street) while continuing their experiments in other ‘empty city spaces’ from Smithfield to Donegall Street from 15th – 18th February 2010. On Thursday evening, 18th February 2010 6-9pm, the project will culminate in the public opening of a new exhibition, installed in currently vacant shop units within Haymarket Arcade (between Royal Avenue and Gresham Street). The duration of the exhibit, curated by Saul Golden and Liam McComish, depends on the rates of vacancy and will change. The displays will remain available for public viewing during Arcade open hours. As part of wider research the experiments and exhibition hope to draw attention to Belfast’s vital urban spaces, inviting questions and feedback on ways to re-think, re-assess and revive the art of urban conversation for a new generation. Saul Golden is an architect and lecturer in the School of Architecture and Design BA (Hons) Architecture and MArch programmes. He has a number of published articles in professional journals focused on architecture and the value of public space in urban design. Liam McComish is a lecturer and Course Director for the BDes Design for Visual Communication programme. He is experienced in design, education and research and has a number of publications in the area of typography, design perception and design methods. Tags: Belfast, UU, What's wrong with this place?